Please tell us whether we have understood your Design King William Road wishes. 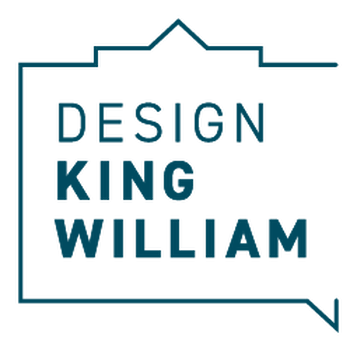 As I indicated in my recent Design King William Road Blog Council has listened to what you wish the future King William road should look like. We are pumped too that you see it as more than pavers v bitumen. This paints a picture of a pedestrian environment more than a vehicle dominated space. With this information we have put together several design options. These options we are presenting are our interpretation of what you have asked us for. The first and I suggest most important in designing King William Road is the structure of the street. We offer three options. They are increasing to different degrees greening elements, pedestrian crossing points, outdoor spaces with a commensurate reduction in on street carparking. The second is (yes) the surface. We offer three options again. They include variations of the extent of and areas to be paved. The third is one I encourage everyone to understand. It focuses on kerbing between foot traffic areas and vehicle access areas. The options include keeping the traditional kerb and water table kerbing we have now. The other options include an alternative of a roll over kerb and a no kerb option. The no-kerb option is surely (if I can prompt) the one that provides the safest and more inclusive crossing the street options we can provide. People using mobility scooters and chairs or parent s pushing prams will find this the best option. 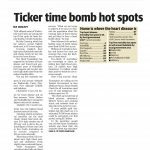 It will be the best option to for a safe event environment (just like Rundle Mall). Please do this. It is your street after all. 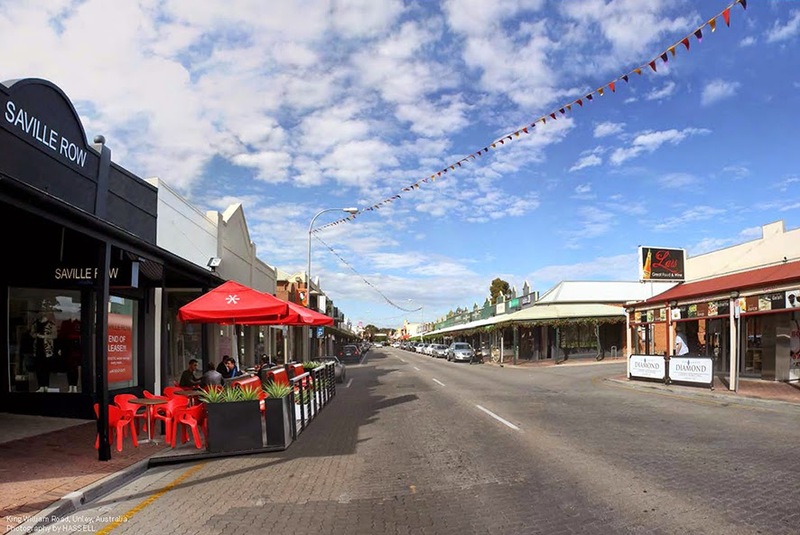 Over the last month many of you have inspired us with your insights into what is required to make King William Road the most loved main street in South Australia. Thank you for that. We now want to know, have we understood your input into Design King William. The majority of the feedback we have received to date highlights your desire for a more beautiful, active and accessible main street. To design King William Road with more greening, spaces for people, with safer points to cross King William Road. A desire balanced with the need for on-street parking. What I have seen inspires me. It re-affirms my own vision of how it can become the most loved main street in South Australia. Thank you. In response, our design team has prepared three demonstrations of how these elements could be included in the street to varying degrees. As a result, we need your help again. From Monday we are seeking your input again. This time, to evaluate these 3 designs. In addition, we will also have three approaches to the road surface. This includes from fully paving the roadway, parking spaces and footpaths, to a bitumen roadway with pavers limited to parking spaces and the footpaths. Each option is a different look for King William Road. They also carry different construction timelines and levels of disruption for visitors, traders and motorists. We’re keen to understand what you consider is the best solution while maintaining the charm and character as we re-design King William Road. From next Monday, this new material will be on display in the shop front, as well as accessible online. We will record your preferences to help inform the eventual design outcome. My colleagues and I will then be able to make as informed a decision as is possible. Together we can make King William Road the most loved main street in South Australia. That is our aim. 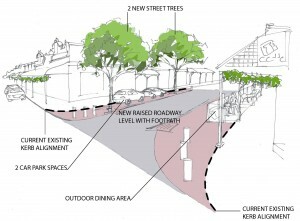 To design King William Road to be the most loved main street in Adelaide. King William Road is already seen by most as unique. A Council owned main street that is covered with brick pavers rather than bitumen. A street much loved already. It is a street, a precinct, though that has lost much of it’s magic. A street looking aged and weary. A street that has a road structure and surface that is in urgent need of replacement. Once, the most loved main street in Adelaide. Council has had a vision since 2014 to return the street to its former glory. To ensure that the unique brick paved road is truly the most loved main street in Adelaide. This means looking at far more than just the paving. The paving is considered by many as the reason the street is seen as unique. But focusing however on the paving must not limit the scope of the project. To be the most loved main street in Adelaide we are looking for your contribution. To be the most loved main street in Adelaide we need your input. Whether you are a property owner or business operator in the street, whether you are a shopper, a visitor, or otherwise use the street. We need to know what you see as important to achieve our aim of making it the most loved main street in Adelaide. Yes, we want your input into what the surface might constructed of. What we really need to know however is whether cars, bikes or pedestrians should have priority. We want to know from you whether the street should allow for outdoor dining and/or rest and recreation areas. We also want to know from you about how important on-road parking is, verses off-street parking. 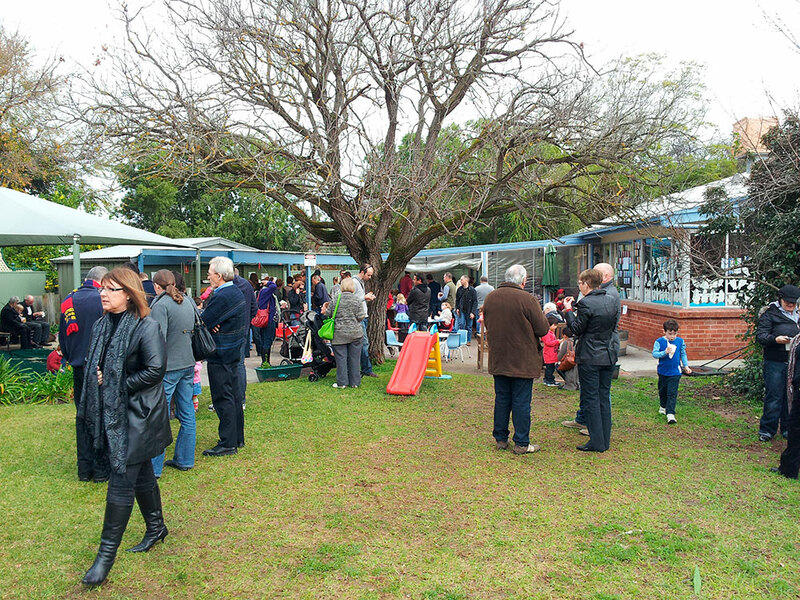 Beyond that we want to know such as if you believe we should improve the tree and greening of the precinct. What about the use of smart technology. Technology that would direct you to vacant carparking. Technology that would allow you to recharge your smart phones, or your disability scooter. What about technology that lights up your path as you pass a given location or directs you to what is available in the next block of shops. Help us to design King William. Help us to make King William Road the most loved main street in Adelaide. Visit our website at https://www.designkingwilliam.com/ or find the link on Council’s website. You can subscribe to stay updated if you love the street already. Transforming King William Road- where to from here. In this blog I hope to answer the question Transforming King William Road- where to from here? The need to transform King William Road was addressed in my last blog. 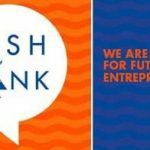 In this blog I provide some insight into what is planned next. So…..Transforming King William Road- where to from here? The parklets that were located in Opey Avenue and in Bloomsbury Street have been relocated as other businesses have indicated to Council desire to have them in front of their businesses. Turning the street into a more people friendly environment is being appreciated. The locations where there were will not revert back to the old days of a year or more ago. Use of the parklets has always been for a time limited period. These street intersections with King William Road however are about to be permanently transformed. Both businesses who requested the original parklets are so impressed they want a permanent solution. In April work will commence on constructing kerb build outs at both Opey and Bloomsbury. These build outs will benefit all businesses in that they will, we expect, attract people to stop and stay awhile at King William Road. They will be similar to what has already been constructed on the corner of Unley Road. Whilst built for safety reasons it is obvious by casual observation that this is a popular hang out for people shopping in our precinct. it will be a raised area, at the same height as the adjacent footpaths. 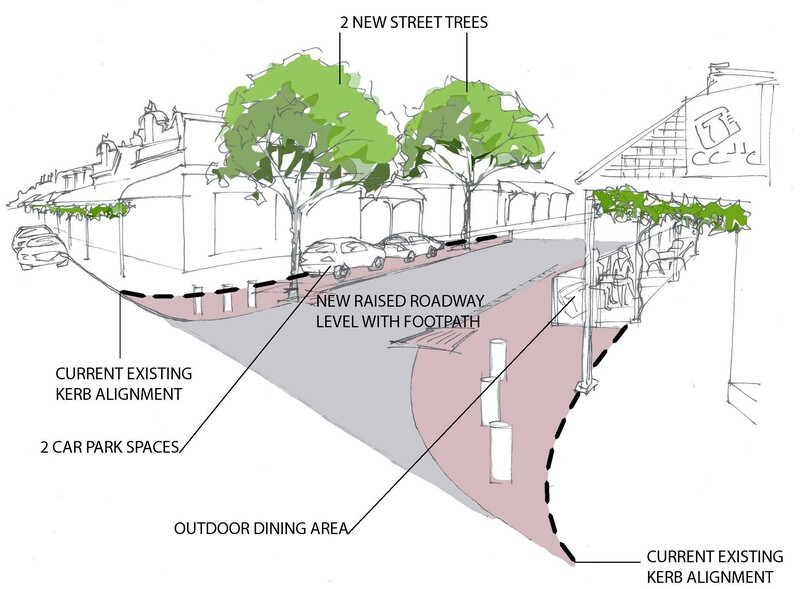 For your reference and knowing Transforming King William Road- where to from here the link below to our website will take you to the KWR document – page 48 describes the Side street intersections under the Curated Street Concept. Transforming King William Road has been high on Council’s agenda for some time now. 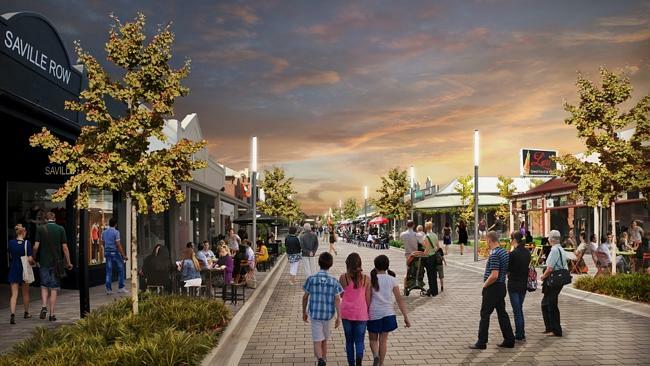 Respective Councils have recognised the need for transforming King William Road, many would argue Adelaide’s premier shopping strip, to make it relevant for the future. 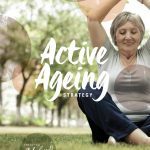 Relevancy for the future is ensuring it supports the ageing baby boomers and with that an increase in the number of people with physical disabilities. It requires evolving into the sort of precinct most likely to be adopted by the emerging Gen Ys. 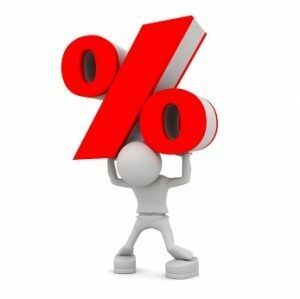 Sorry Gen X but research shows that in 2017 you will have surpassed the boomers as the group with the most buying power. By 2020 you in turn will be surpassed by Gen Y. Back to the boomers, we will need a shopping environment that will support our mobility concerns. We will need to navigate from one side of the road to the other, have ease of access to the shops. With the car being currently the most important means of moving people and with entrances to the shops being high steps this presents a significant challenge. Gen Y on the other hand is a group looking for inner city living by preference to enjoy the cosmopolitan lifestyle. Their movement preference hierarchy we are being told is walking first, followed by cycling and then public transport in its varying forms. Cars will be (it is suggested) the least preferred means of moving people. 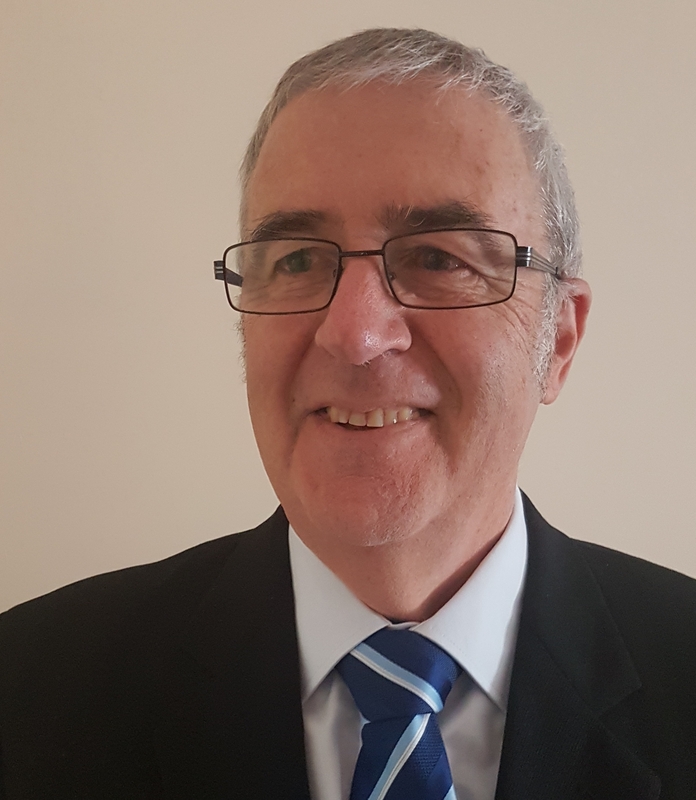 Meeting these needs and many others is a costly exercise and Council in acknowledging this has recognised that a gradual transportation is a sensible approach. So we trialled the parklets with great success. These have proved very popular. They have been well utilised by consumers frequenting the King William Road shopping strip. These people are staying longer as a result and apparently are spending more while there as a result. Any negative from say the reduction in available car parks has been well and truly trumped. So successful have they been that other traders want them on front of their premises. A far cry from only a few years ago when they would rue the loss of the car park in front of their shop. So successful has this been that we are about to commence the next step in transforming King William Road. Please look out for my next blog for some detail on this. 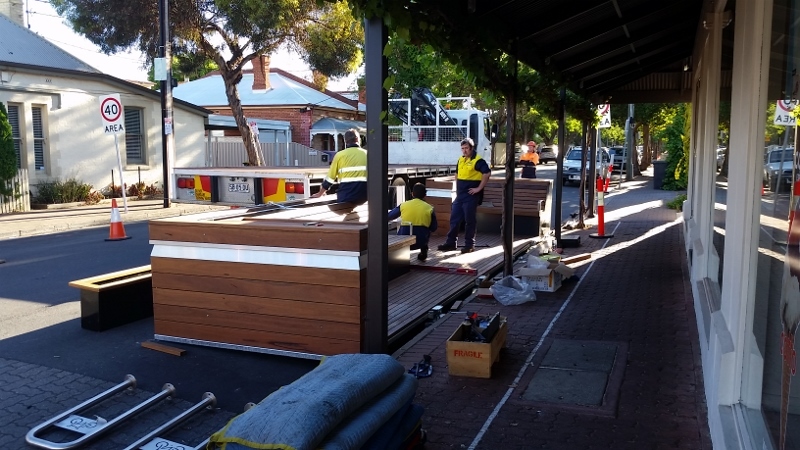 After the successful Parklet trial mid year last year as part of Council’s long term vision for the King William Road Precinct the first of two Parklets has been constructed at the corner of King William Road and Opey avenue. This Parklet, otherwise known as a temporary public space, has been created within the footprint of two car-parks in Opey Street outside Cotto. It will provide areas for people to meet gather and enjoy the local environment. A second parklet will be constructed outside Nutrition Republic. Both should be operational within the next week. Focusing more on giving people a reason to visit and stay (a focus on people) rather than were they can park (a focus on cars) these new parklets should help to revitalize Adelaide’s premier retail strip. It will create new life. Available under licence fr a 12 month period they will provide great opportunity for people to stay in the precinct in a similar manner to shopping centres. After 12 months, new locations to relocate the Parklets will be sought from the local community. The Cotto Parklet will seek to create a safe and welcoming setting for young families to visit King William Road and for children to spend time within the precinct. The Parklet will provide activities to entertain children as well encourage local music, face painting and food displays throughout the year. 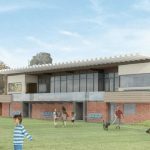 Nutrition Republic will provide a social setting for people to pause and relax whilst they are out walking their dog, going for a run or ride, or after a local yoga class. The Parklet will also host a range of community demonstrations around health and wellness and welcome the input of other local businesses. The Parklets are expected to be open for public use by the 31st of January. For further information on the Parklet Program and nomination process, please visit www.unley.sa.gov.au.